A rare Canadian penny billed as “the king of Canadian coins” was purchased for $402,500 US at a New York auction Sunday. A 1936 Canadian “dot cent” had garnered considerable online traffic after bidding began earlier this week on the Dallas-based Heritage Auctions website. Only three of such pennies are known to exist; the makeshift coin was struck — but never circulated — after the death of King George V.
Canadian authorities had prepared to produce coins with the effigy of King Edward VIII, who succeeded George V, but Edward VIII then stepped down from the throne to marry an American divorcee and the dies for the coins carrying Edward’s image could not be used. In response, the 1936 coin was put back into production with only a tiny dot below the date to differentiate it. The famed 1936 Canadian “Dot Cent” was the highlight of a group of coins billed as the single most substantial collection of Canadian coins ever offered at public auction. Heritage Auction, which ran the sale, had predicted the penny would fetch at least $300,000. 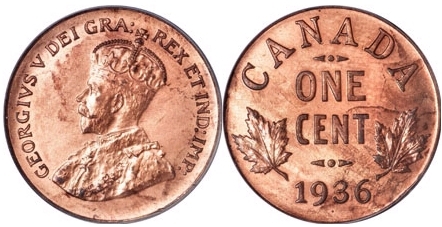 The penny is rare because it’s one of only three known 1936-dated Canadian cents struck by the Royal Canadian Mint with a small but distinctive dot below the date to indicate it actually was made in 1937. The penny bears the image of King George V, who died in January 1936 but coins with his image continued to be made that year. When George’s successor, Edward VIII, abdicated the throne in December of the same year, the coin-making dies prepared for 1937 with Edward’s image were no longer valid. The mint experimented with 1936-dated coins struck in 1937 with a dot added to the design to distinguish them from coins struck earlier. Dot Cents were long considered unavailable as all three were held by noted American numismatist John Jay Pittman, who paid $250 for them in 1954. They were auctioned off after his death in 1996. Whoa! This particular amazing sharing. thank you fantastic!